Pempek is a typical food of Palembang, South Sumatra, Indonesia, mostly processed in the form of wet with a moisture content of 50-60%, so that it only lasts for 3-4 days. In order for pempek to long last, it was processed into instant pempek using the freeze drying method. Pempek had tube form with a size of 3 cm in high and 4 cm in diameter. This study was aimed to see the freeze drying pressure and time to length of cooking, density, and lightness of instant pempek. Stored pempek at temperature of -50° C was carried out freeze drying with a pressure of 0.002 bar, 004 bar, 0.006 bar, and 0.008 bar for 38 hours, 40 hours, 42 hours, and 44 hours with a methodology of Split the Duncan Real Distance Difference Test Plot Design. The result showed that the pressure and time had very significant effect on the length of cooking, density and lightness of pempek. P3 (0.006 bar) pressure treatment affected shorter cooking time of pempek about 10.83 minutes, L2 treatment has 14.17 minutes for cooking times and the P3L2 treatment combination has low density of 0.71 g / cm3 and color brightness (lightness) about 85.38, almost resemble with white color. Making instant pempek with freeze drying method gave better results in ways of shorter and faster cooking time than instant pempek by other drying methods. ALHANANNASIR, A. et al. KARAKTERISTIK LAMA MASAK DAN WARNA PEMPEK INSTAN DENGAN METODE FREEZE DRYING. JURNAL AGROTEKNOLOGI, [S.l. ], v. 12, n. 02, p. 158-166, dec. 2018. ISSN 2502-4906. 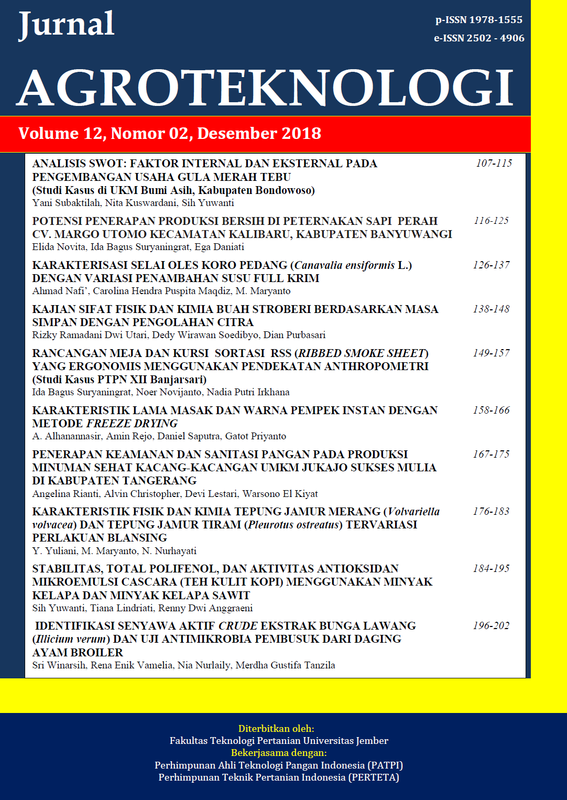 Available at: <https://jurnal.unej.ac.id/index.php/JAGT/article/view/9281>. Date accessed: 23 apr. 2019. doi: https://doi.org/10.19184/j-agt.v12i02.9281.